Christopher Myers and Joanne Chang have a partnership filled with love. Love for each other, love of food, love for their friends and family, and especially love for their collaborative projects and businesses. One can taste the love in the many recipes in their new cookbook that have been tested, re-tested, and then tweaked. The results can be experienced by our culinary senses either at their popular Boston restaurant Myers+Chang or now, thanks to this new cookbook, in our kitchens. Theirs is a love story that was destined to happen. Christopher and Joanne’s friendship developed over the desserts she produced at Rialto in Cambridge, MA. He was an owner, she the pastry chef. Following Christopher’s mentorship and encouragement, Joanne’s many bakeries, named Flour, spread throughout Boston’s neighborhoods. Only when Christopher was no longer her boss did she find the courage to tell him that their relationship went beyond friendship. They eloped instead of having a large wedding and decided that an opening party for their restaurant family at M+C (as they refer to the restaurant) would serve as a celebration of their love for each other and their love for Asian food. The book’s introduction tells the story of Asian food. This is the food that Joanne cooks at home on Sunday evenings. Joanne teaches us not only how to cook this food but how to eat it as well. The recipes are a compilation of recipes seasoned and tested by Joanne, her mother, her Auntie Mia and many others. Joanne speaks lovingly of her Asian grandma who spoke no English but shared many of her culinary secrets. However, the restaurant’s menu and the book are not tied to one style of cooking. She writes of turning a typically southern chicken and waffles dish into an Indonesian concoction. Sloppy Joes become Korean barbeque beef. Traditional Asian cuisine is not what they had in mind for their restaurant. As a child Chang experienced her first meal eaten without her family. She was confused. “Where’s the rice?” she asked. According to Joanne a meal is not a meal unless it comes with mountains of rice to be combined with other elements to create a perfectly balanced mouthful. She teaches us how to use chopsticks and how to slow down our eating. Americans tend to eat too quickly without giving themselves time to appreciate the flavors and nuances of the food they consume. Chopsticks, on the other hand, compel one to slow down and to enjoy the meal. Joanne clearly spells out and defines the variety of foods found in Chinese markets. Asian grocery stores tend to be very confusing. Generally nothing is written in English, and the employees often speak no English. Her lessons on equipping a kitchen are also invaluable. Although a rice cooker is not mandatory, it could become a necessity in one’s kitchen. Myers + Chang is not your typical Asian restaurant, and neither is this just another cookbook. Each recipe is preceded by a paragraph describing a personal reason for including the recipe. The recipes are not your typical Chinatown fare. The “Esti’s” Hot and Sour soup—named for Christopher’s muse, best friend, and former business partner—is “an homage to her family of food-obsessed Jews from the old country of Brooklyn, by way of Russia.” The Corn and Coconut Soup is velvety and scrumptious—and just as good the next day. Many of the recipes are vegetarian, and many can be modified by eliminating the animal protein and substituting oil for butter. Although M+C has had several chefs running the show, this cookbook would not have happened without Karen Akunowicz who is described as “strong willed, passionate, gorgeous, and powerful.” With the help of the “Chang Gang” who were the recipe testers, Karen got the 80 recipes in this book ready for us to learn. She took her Mediterranean and Italian training and infused it into Asian food to create some of the most fascinating recipes. 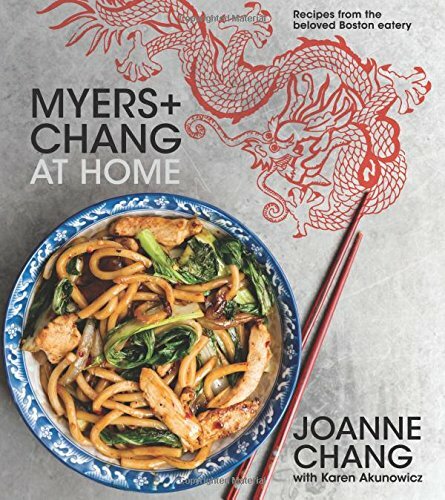 Myers+Chang at Home succeeds for the home cook because the contents come directly from the Chang’s family’s repertoire of recipes cooked at home for many generations and tweaked to become their own. By cooking and eating this food one begins to understand the Chinese culture. Food is made with love, and it tastes that way. Chopsticks allow one to slow down and eat mindfully, appreciating all the tastes and flavors. Love is what this cookbook is about.